Preface (G. Marquis, J. Solin). Fatigue assessment of an automotive suspension component using deterministic and probabilistic approaches (J. Devlukia, H. Bargmann). A fatigue life assessment methodology for automotive components (A.-S. Béranger et al.). Fatigue strength prediction for grey cast iron components of complex geometry (D.H. Allen, P.M. Hughes). Defect sensitivity in nodular cast iron for safety critical components (K. Hamberg et al.). 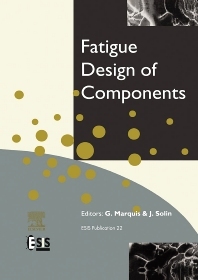 Fatigue design and quality control of flapper valves (H. Ikeda, Y. Murakami). Durability assessments of straddle carrier wheel supports (A. Siljander et al.). Fatigue design of pressed steel sheet (A. Gustavsson, A. Melander). A multiaxial fatigue life prediction program (T.E. Langlais et al.). Fatigue failure of a connecting rod (R. Rabb). Notch stress-strain analysis in multiaxial fatigue (M.N.K. Singh et al.). Fracture mechanical fatigue analysis of railway wheels with rolling defects (K.-O. Edel, G. Boudnitski). A novel fatigue analysis approach for tubular welded joints (E. Niemi, P. Yrjölä). Fatigue design of welded thin sheet structures (J.-L. Fayard et al.). Fatigue of welded joints under complex loading (G.R. Razmjoo, P.J. Tubby). Effectiveness of improvement methods for welded connections subjected to variable amplitude loading (V. Dubois, M.A. Hirt). Influence of life improvement techniques on different steel grades under fatigue loading (L.L. Martinez, A.F. Blom). On multiaxial fatigue testing time reduction (D.S. Tchankov, T. Giunti). Standard fatigue tests for components (L.P. Pook). A new method for fatigue life improvement of screws (Shin-ichi Nishida et al.). Author index. This volume contains a selection of papers presented at Fatigue Design 95 held in Helsinki, Finland from 5-8 September 1995. The papers have been peer reviewed and present practical aspects for the design of components and structures to avoid fatigue failure. Topics covered include: fatigue design experiences, ground vehicle components, component reliability, multiaxial fatigue, notch analysis, service loading, welded structures, probabilistics aspects in fatigue, fatigue design optimization. For fatigue specialists, material scientists, academic and practising engineers.